important a topic this is. So I thought it useful, as we prepare for the next March 19 Webinar, to interview the key player in the live events industry for all things safety related. I sat down with Jim to get an update on the ESA activities, and the ESA Event Safety Guide. Keene: The evolution of the ESA Event Safety Guide has happened in response to a series of accidents within the live event industry, to formulate a series of best practices culled from the experience and insight of top professionals within the event industry, as well as relevant life safety standards currently applicable by groups such as OSHA, NFPA, ICC and PLASA. How are your initiatives related to what, say, PLASA is doing? Digby: PLASA and the ESA publicly announced their mutual support for each other’s efforts. PLASA's central focus is the creation of extremely necessary equipment technical standards and protocol's. The ESA is central to the human side and smart decision making. By encapsulating and aiding in the proliferation of the work of PLASA, OSHA, NFPA, ICC and other standards writing bodies the Event Safety Guide consolidates the majority of the references necessary to make intelligent decisions in one document. Keene: We hear more about safety issues for entertainment events– live concerts, etc. But what about corporate events? Entertainment events are usually “tours”; corporate events are usually one-offs. How does this affect safety issues? Digby: The best practices contained within the Event Safety Guide are scaleable regardless of venue or type of event. Additional specific guidance is in process to target theater, convention, circus and specialty event types. But generally, rigging is rigging and the safety best practices that guide it are generally applicable regardless of event type. Keene: How similar will your version of the Safety Guide be to the British version or "the purple guide"? Digby: The decision of our friends across the pond to allow us to utilize HSE 195 (the Purple Guide) as our framework has been crucial in expediting the process. One of our wisest decisions to date was to borrow directly from the UK version rather than attempt to build it from the ground up. This would have taken significantly longer to bring the guidance to life and in the interim the possibility for continued decline in operational protocol. We remain forever indebted to the HSE for granting us use of the Purple Guide. Keene: Has there been any talk of online web training courses similar to the FEMA courses? And what about possible lectures, or quizzes? Digby: The ESA is exploring ALL methodologies to extend the reach and result of the guidance, in short– yes. We are currently constructing the first of its kind Summit for Safety Event Leadership Training that we intend to deliver by year’s end 2014. Additionally, we will be test piloting a handful of new procedures within the framework of music tours which we will be documenting and making available to the membership body as training material. It bears commenting here that the leadership of the ESA are also training themselves with the help of other industries who have experienced similar best practice transitions. There is much to learn from the airline industry, surgeons, construction and yes– even NASA. We will be engaging directly with the thought leaders in these spaces who have helped to develop the protocol's now in place to ensure best practices are easy and applicable at every level and serve the purpose of preventing injury and catastrophe. Keene: Is the ESA Scalable to help smaller or start-up vendors in the industry to ensure they are aligned? Keene: When will the ESA Event Safety Guide be available? Digby: We are currently at the mercy of the processes within iTunes, Amazon and Barnes and Noble. Our hope is that it will be live electronically as this interview goes to print. When this happens it will also be available through the ESA website. Keene: How do our readers order a copy of the book? Digby: Visit eventsafetyalliance.org and follow the instructions on how to order. Keene: Last November’s webinar on live event safety was extremely well received by the industry. Will there be more webinars? Digby: Absolutely. The date for the next Take 1/ESA webinar has been set for March 19, 2014. The Webinar will be entitled “Ready for Summer? 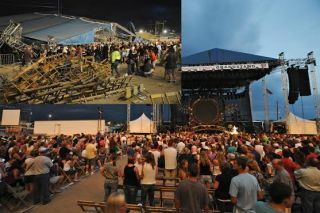 A 60-Minute primer on Producing Safer Outdoor Events”. The co-presenter at last November’s Live Event Safety Webinar was Scott Carroll, Executive Vice President & Program Director at Take1 Insurance. Carroll provided the insurance perspective and addressed not only the importance of having the right coverage but also the likely pressures to be brought on live event producers to have certain event safety programs and training in place as a condition of coverage. I asked Scott to highlight some of top live event safety concerns from an insurance perspective. Keene: If a staging company does not have an event safety plan in place, are they at risk to have their insurance company deny a claim? Carroll: It’s more likely that the insurance companies will simply cancel an insured’s coverage for not complying with an underwriting requirement, such as having an event safety plan. If the carrier discovers a plan does not exist it’s quite possible they will cancel the policies in force for that insured. Keene: If I’m a stager, how do I know if my current insurance that I carry is adequate for all contingencies? Carroll: No insurance policy is a guarantee of protection against all contingencies. However, to be as certain as you can be, the first step is to connect your self with an experienced insurance agent who truly understands your business and the business of entertainment. The next best thing is to make sure your insurance company is familiar with entertainment. Finally, have your insurance agent review your current coverage against what’s available in the industry. This is their job and a good insurance agent looks forward to the opportunity to provide that review. Keene: If a Local Union doest not carry liability insurance, as a vendor that is forced by the venue to use them, how is that vendor best to make sure they are protected from them? Carroll: This is a great question. It’s incumbent upon the venue to demand that all vendors be properly insured or they should not be allowed to work within the venue. As a vendor, you should have a conversation with the venue about their insurance requirements of all of their vendors. Ask the venue if they have ever considered purchasing a TULIP (Tenants User Liability Insurance Program) for providing coverage to such vendors working within their venue. Keene: Is the finding of an insurance company geographically driven? e.g. for an event in NY should a staging company use a company out of Dallas? Carroll: No, it’s industry driven. Our industry is entertainment centric– therefore, you want to work with a market (carrier) who is familiar with and comfortable with the needs of the entertainment industry. Also, they should have dedicated insurance claims personnel familiar with entertainment claims.